Two days ago I posted about finding a stitch combo that looked like the knit moss stitch. And, as promised, here is a free pattern for you to try it out. I made it as an afghan square, but you could easily use it as a dishcloth pattern. Row 1: slip stitch in 3rd ch from hook, *hdc in next ch, sl st in next ch, repeat from * across, turn. Row 2: ch2, skip 1st stitch, slip stitch in next st, * hdc in next st, slip st in next st, repeat from * across, turn. Row 3 – 42: Repeat Row 2 until project is square. Round 1: ch1, 3sc in corner stitch, sc in each stitch across top, 3sc in corner stitch, sc evenly down side, 3sc in corner stitch, sc in each stitch across bottom, 3sc in corner stitch, sc evenly up side, slip stitch to 1st sc, turn. Round 2: ch1, sc in each sc around with 3sc in corner stitch, turn. Thank you so much for the pattern, I love it! 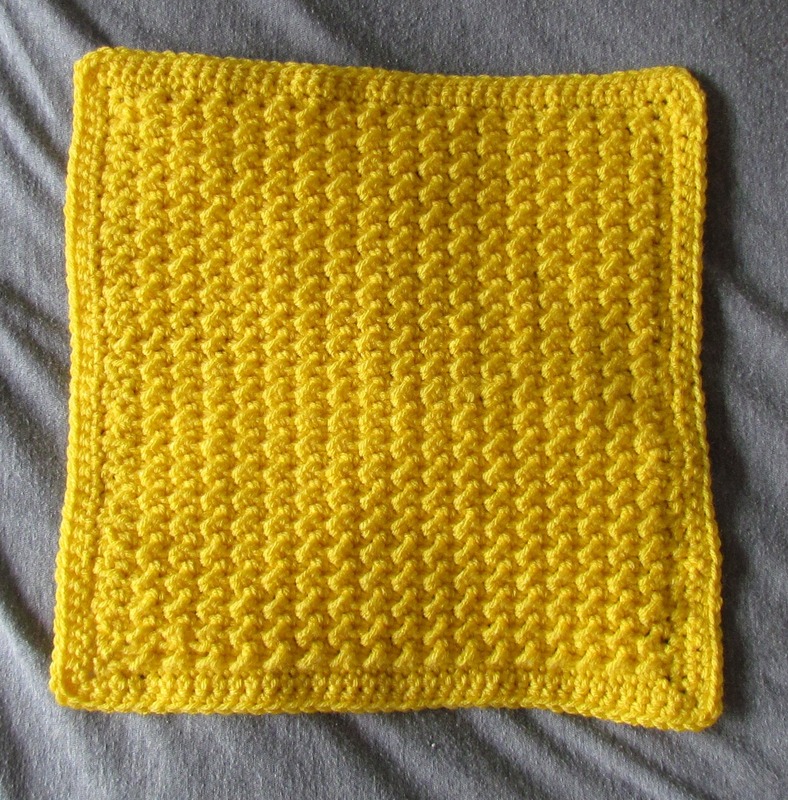 That’s a nice square, would also make a nice scarf I think, looks nice and solid and would therefore be warm. To pay it forward, create a post mentioning the award. Include 7 factoids about yourself in the post. Then list 15 blogs you’ll bestow with a Versatile Blogger Award. Very nice! I love when I can find a pattern that resembles something in knit and make it into something beautiful. Thanks for the pattern! Love this pattern and would like to use it for a baby blanket. What are the multiples or how many chains would you suggest? Thanks for your help. Just increase in pairs. The repeat is only 2 stitches, so any number of pairs. Hope that makes sense. If not let me know and I’ll see if I can give you some better examples. Can you cross stitch on this? Every other stitch is raised, so I’m not sure how it would come out if it’s not flat. 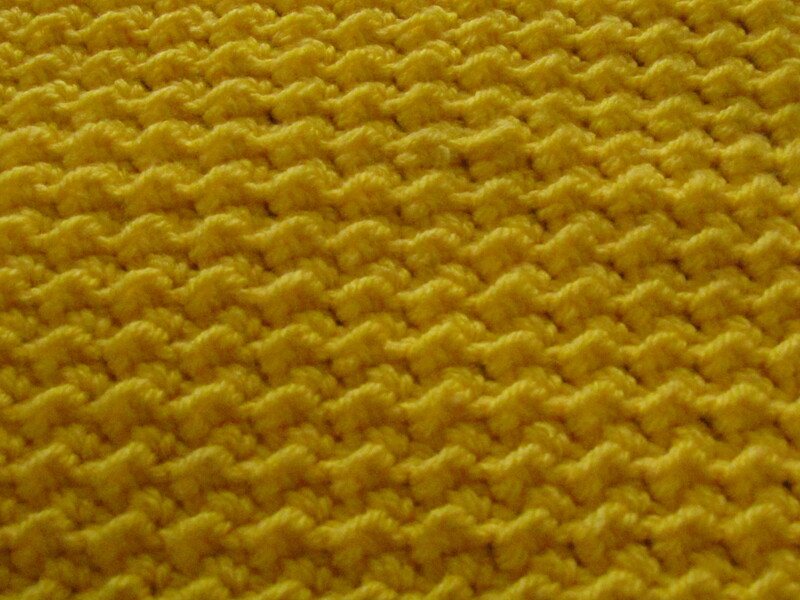 My daughter has requested that I crochet an infinity scarf using this stitch. Any suggestions as to how many chain stitches I should use? And how to start new rows? Thanks. I haven’t tried this stitch without turning your work, so I would suggest turning after each row. What about making it one long scarf and whip stitching the first and last rows together? If you want me to come up with a pattern for it in circular form, I can try to work on it after the first of the year. Let me know. Hi love the pattern I am not sure what you mean when you say slip stitch I haven’t heard of this stitch in crochet, can you explain this stitch thank you. I’ll do a photo tutorial of the slip stitch for you. If you normally read UK patterns it would probably be a sc for you. US terms call that a slip stitch. I should be able to get that up in the next day or so for you. Thanks for the pattern! It was right on time . I needed to learn the moss stitch for a hat I wanted to make and didn’t know the stitch. Pingback: Crochet Stitch Combinations #2 – Free Pattern Friday Round Up! Right now I have 5 small children at home and never have a quiet minute, so I can’t do video tutorials. Sorry. To make this as a blanket. I should do it in multiples of 2 plus 1, is that correct? Hi I’m kind of confused and want to make sure I’m doing it right …, on row to will I hdc in the slip st? And then slip st in the hdc? Yes, that is correct. Let me know if you have any other questions. Are you going through both loops when you hdc and slip stitch or the back loop or the front loop? Hi Sheila, I went through both loops.